I can’t believe that nearly an entire year has gone by since I last came to play and post in this space, but what do you know? It most certainly has. Prior to the election, I made a promise to myself that I’d return to this spot in the new year and get back into documenting all the creative goings on in this little life of mine; endeavors put aside temporarily only because of a busy and exciting new job, lots of outdoor exploration in the spring and summer, some travel, and then surgery and recovery for Bear toward the end of the year. Now, here we are in 2017, and we’re living in what often feels like a scarier version of the Upside Down à la Stranger Things. Indeed, we have our very own (orange) demogorgon and a corrupt band of racists and xenophobes propping him up and pulling the strings. I’m recommitting to getting back into creating, posting, and sharing here because, honestly, I need a creative outlet in my life that feels connected to a wider community and audience – of dear friends in different parts of the world, of my beloved queer femme community, and of other creative types and bloggers. It’s a necessary salve in a terrifying time. I thought for weeks that my return to Femme Fraîche would be with a roasted chicken recipe I’ve been working on perfecting (that sounds boring, but I promise it’s anything but and I’ll give lots more details soon! You’re gonna love it! 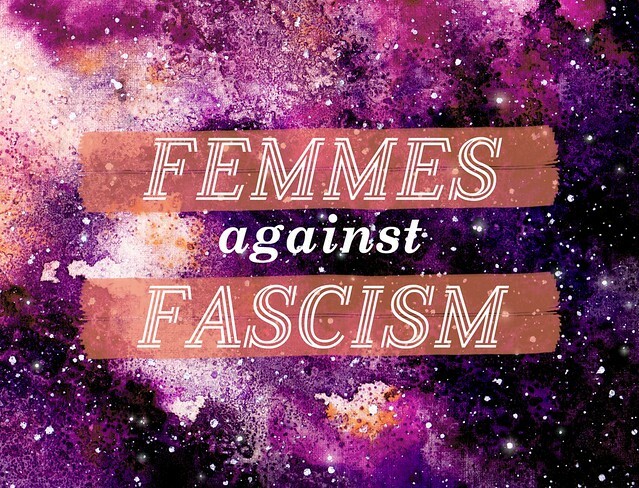 ), but instead, here I am making desktop, mobile, and social media wallpapers proclaiming Femmes Against Fascism. Resistance comes in so many forms, you know? And while spending a few hours in Photoshop is certainly not a replacement from joining up with local protests, calling in white family and friends, and supporting the work of POCs and POC-led orgs, it’s one way I’m using my hands and honing in when the day-to-day finds me reeling with no end in sight. 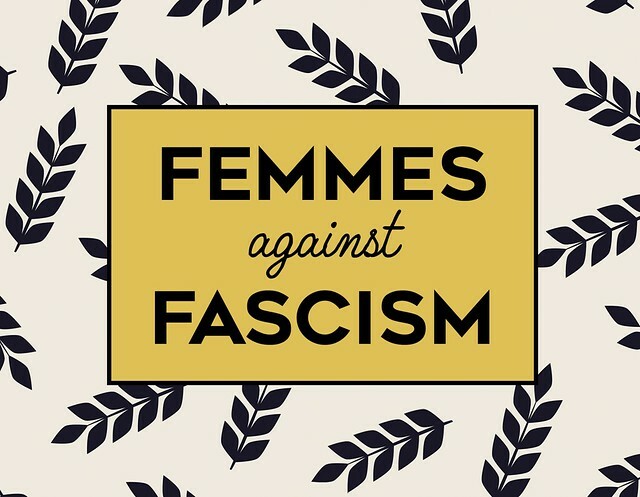 For me, the slogan of Femmes Against Fascism, though it may have roots elsewhere, is very much inspired by the awesome patches, t-shirts, and banners designed by femme artist, Christina Mancinas, whose online store you must check out. Seriously, go to sleepybbybutt right now and buy all the things. I can’t wait for my haul to arrive! 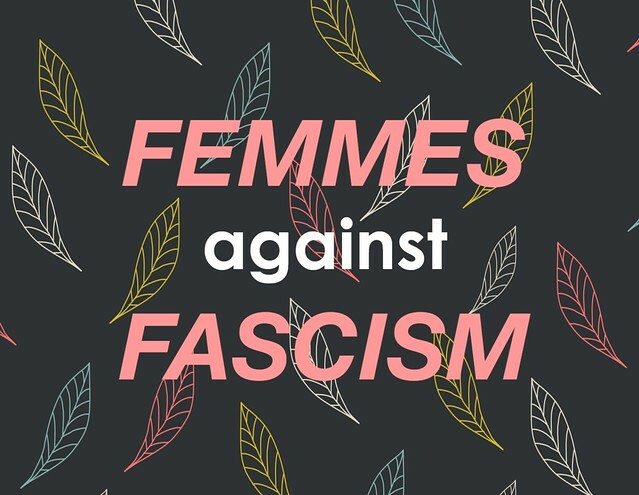 In the meantime, you can use these image sets below to dress your tech and spread the word of Femmes Against Fascism. Click below to go on over to my Flickr account where they’re hosted and use the download arrow in the bottom right hand corner of each image. Just make sure you’re downloading it in the original size, so that the dimensions are correct. I’d love to see snaps and hear stories of you using them out in the world for some added inspiration if you’re down to share! What other ways are you creatively using your downtime to resist? Sending love, solidarity, and endurance, femmes, friends, and readers. I’ll see you back here really soon!